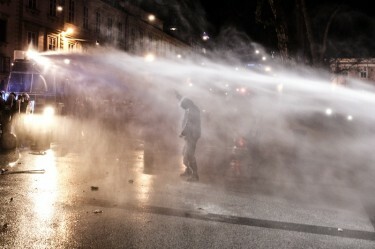 [...] Pahor will start his mandate among very tense social and political circumstances. In the past week, numerous mass protests have spread across Slovenia expressing genuine feelings of disappointment and anger about the precarious situation in which Slovenia finds itself merely 21 years after gaining independence. For the fellow readers from abroad. New president of Slovenia Mr. Pahor ("Barbie") won with the votes of 27,7% of the electorate. Those figures are so low because the electorate is fed up with false choices - only 42% did bother to cast a vote at all. Conclusion - over 72,3% of the electorate did not elect the new president who ran the campaign under the slogan "Together!". 14.546 ballots were "invalid". That's 2% of all votes cast. "Gotof si!" is also the last fashion motto of the protest against the corrupt elite. 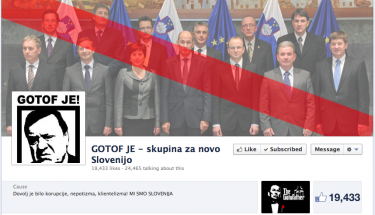 A screenshot of the Facebook page [sl] of the "Gotof je" protest: "A community for a new Slovenia. Enough of corruption, nepotism, clientelism! WE ARE SLOVENIA"
[...] Upwards of 10,000 people gathered in Ljubljana yesterday, one of seven Slovenian cities where hastily organized demonstrations took place to protest what’s perceived as widespread fraud and corruption, austerity measures, and the economic reform policies of the center-right government of Prime Minister Janez Jansa. Here in the capital, the demonstration began at 4 pm in Kongresni Trg, or Congress Square, before moving a couple hours later towards Trg Republike, or Republic Square, near Parliament. Protesters were loud and at times blunt, but peaceful. Police stationed near Parliament were relaxed –certainly much more than they were on Tuesday – some of them exchanging banter and conversation with demonstrators. 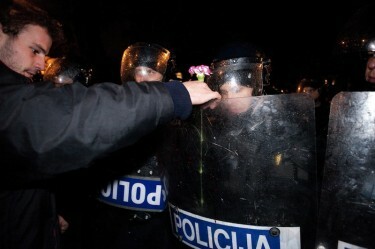 Many were wearing carnations given to them by protesters whose chants included, ‘higher salaries for police’. [...] And then a gang of some 50 (they say) covered up bastards rushed into the crowd and started throwing everything (and yes, they came well prepared) they had in their pockets at the police and the crowd. As someone I know very well (and who I totally believe would not be making up this) described: A guy was standing close to me, and he said into the phone. 'Ok, it is all ready. Come in now' And then a gang of what she described as highly organised covered up people rushed into the crowd, just a few meters away from me. And that was when all hell broke loose.